Illustrating impactful contrasts between different supply chains, while still ultimately highlighting their common bond: the success and efficiency of the modern supply chain. Without this system, modern trade as we know it would not be possible. Human society is fascinating in its boundless variation, but even the most seemingly disparate populations are connected in highly material ways. Through the supply chain, which connects goods with human needs and serves as the single unifying element of global trade, people overcome boundaries of geography, culture and language in the pursuit of mutual cooperation. Without this system, modern trade as we know it would not be possible. Of course, the supply chain has evolved over time, mapping itself to the cultural and physical landscapes through which it traverses. In doing so, it has become just as diverse as the people it connects. It’s a wide world out there -- where will the supply chain take us next? Although modern supply chain management dates back just shy of a century, with Frederick Taylor’s The Principles of Scientific Management, the supply chain has joined people together since the establishment of the Silk Road more than two thousand years ago. Via this route, Central Asian merchants transported spices, silk cloth, and other luxury goods to their European and North African counterparts. Truly globalized trade routes, however, didn’t emerge until sugar cane plantations in the colonized Americas began to export rum. This was made possible, unfortunately, by the co-development of a different supply chain -- the slave trade. 300 years later, the supply chains of today don’t just deliver goods -- they often serve as a lifeline for human rights, environmental sustainability, and waste reduction. 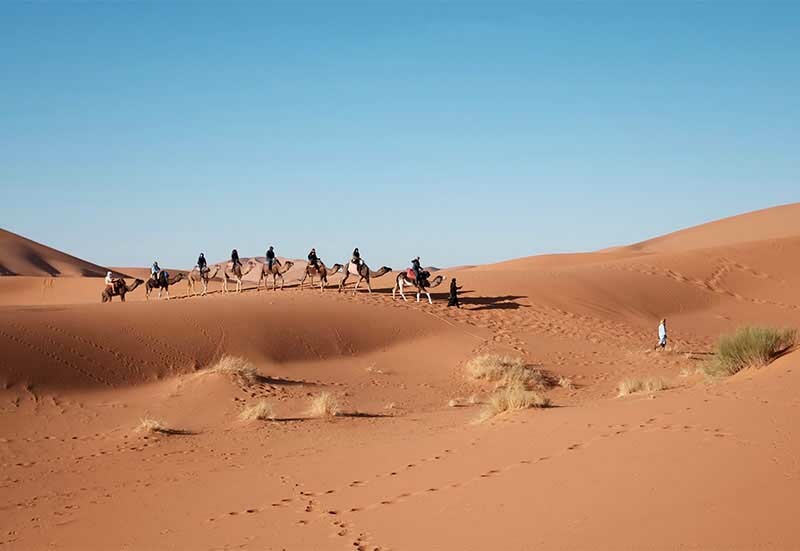 They deliver essential food and medicine to developing nations, just as they guarantee that high-end vacationers have ready access to luxury products. Running the full gamut, supply chains around the world rely upon cutting-edge technology, creative innovation, and a bit of old-fashioned logistical legwork to move supplies from Point A to Point B. In developing nations, supply chains are being utilized in unique ways to deliver crucial medical supplies and food. In Africa, for instance, a burgeoning middle class -- whose growth has outstripped that of Asia -- has spurred a collaborative effort between local liaisons and international companies to create entirely novel supply chain processes in rural areas. ColaLife, for example, repurposed the Coca-Cola supply chain network that exists within many African nations to send anti-diarrheal medicine to remote villages, where untreated diarrhea is a sadly common cause of fatalities. The plan is simple enough -- fit the medicine into soda crates for easy transport -- but has had a revolutionary impact. The demand for these drugs is such that delivering them has become a booming enterprise for Coca-Cola, even without the crates. Other major companies with a presence in Africa are tackling another common problem: supply chain visibility. Novartis, IBM, and Vodafone have joined forces to create SMS for Life, a mobile-based platform that allows health workers in the field to send weekly updates on medical stock needs (particularly for malaria treatment) to a central database by text message. This allows supply chain experts to accurately forecast deliveries and avoid outages at the local level. Since its launch, over 3,000 health facilities in Tanzania and Cameroon have signed up for the program. Meanwhile, the startup Zipline will soon deliver medicinal packages by drone to remote areas in Rwanda, officially partnering with the national government to orchestrate the initiative. It may sound far-fetched, but the plan has received considerable international attention, as it will constitute the first-ever medical application of drones in history. Major corporations have demonstrated their support for Zipline’s mission, including the UPS foundation -- which recently granted the startup a $800,000 grant to help get the initiative off the ground. Of course, the supply chain is equally suited to deliver high-end goods to wealthy customers. In the luxury realm, where customer satisfaction is the prime directive, supply chains must be both complex and finely tuned in order to deliver high-cost items at lightning speed. The highly synchronized supply chain logistics of a luxury cruiseliner serve as a prime example. As the New York Times notes, readying the gargantuan cruiseship Oasis for departure is a monumental undertaking, as over 2,100 crew members have to to offload (and later onboard) 6,000 vacationers, provision tens of thousands of pounds of food and beverages, and cast off from port, all in under 12 hours. For logistics enthusiasts, this precision planning and large-scale execution represents the pinnacle of supply chain management. In the hospitality industry, this kind of complexity is rather routine, even among smaller players. 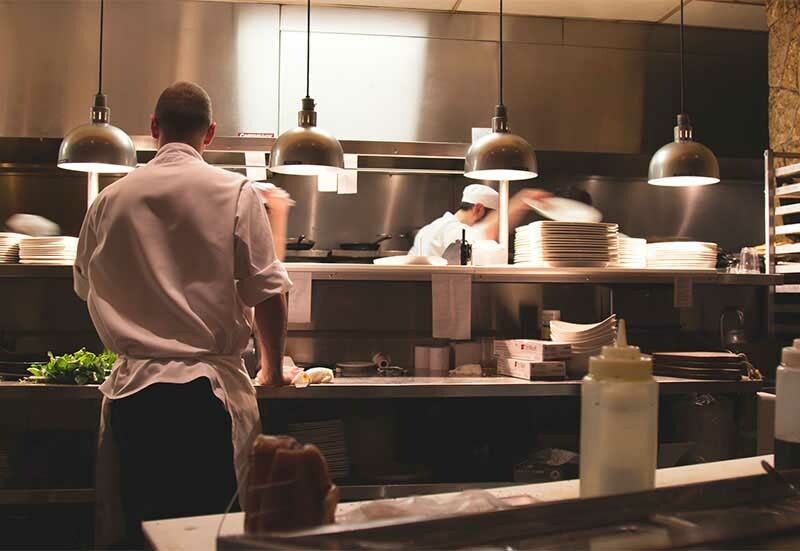 As Inbound Logistics observes, while 70% of American restaurants are standalone and nearly 60% of hospitals house under 75 rooms, industry professionals must regularly handle the purchase of hundreds or even thousands of unique items -- each with their own standards for quality and price -- from a complex web of wholesalers and vendors. Considering that procurement managers for these operations often fulfill many other duties, this is an impressive feat -- and an ode to the sophistication of modern electronic tracking systems. The complexity of these localized hospitality supply chains is mirrored directly in the global supply chain (albeit on a much larger scale), allowing raw materials, component parts, and consumer goods to reach virtually every location imaginable. 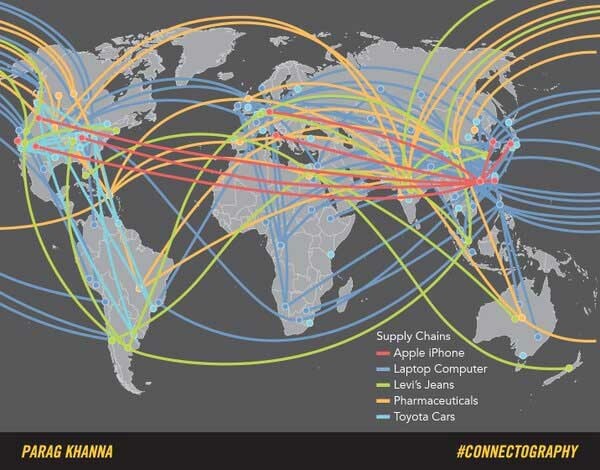 On the map above, each line represents the path that consumer goods like iPhones, cars, and clothing take from manufacturer to consumer; iPhones, for instance, originate in China before being transported to trading partners in Japan, Europe, and North America. And yet this web -- as prodigious as it is -- does not do justice to the truly confounding scale of supply side operations. It charts manufacture and continental shipping, but does not include raw material mining, local distribution, and warehousing, among others. It’s no secret that the vast bulk of manufactured consumer products originate in China; Fast Company reports that roughly 95% of the world’s goods travel through just seven Chinese ports. However, the raw materials that compose those products come from all over the world. For example, many of the rare earth minerals that make up smartphones and TVs are mined outside of Baotou, Mongolia; the majority of lithium, needed for most types of batteries, comes from Bolivia; and over half of the world’s supply of cobalt, necessary for the lithium-ion batteries in Apple and Samsung products, is mined in the Democratic Republic of the Congo. Despite the diverse origins of their source material, manufacturing centers have historically been bound to specific locations -- but suppliers are now radically rethinking this model. The concept of location-specific manufacturing was first called into question five years ago in Fukushima, Japan. Like China, Japan has long been considered a central hub of industrial manufacturing. Prior to 2011, 60% of the word’s auto parts, 22% of the world’s 300 mm silicon wafer supply (a component of many electronic devices), and many other critical consumer product components were manufactured in Fukushima prefecture, according to Harvard Business School. But in March 2011, a tsunami hit Fukushima, setting off three nuclear meltdowns in the Fukushima Daiichi nuclear plant and releasing radioactive material into the surrounding area. With these manufacturing centers rendered inoperable, delays, shortages, and price fluctuations sent the global supply chain into temporary chaos. As a result, suppliers have since realized that they need to remove critical dependencies from the supply chain by centralizing core manufacturing processes; many are pointing to 3D printing technology as a means to this end. As IndustryWeek observes, 3D printers -- which use additive manufacturing techniques to construct physical objects layer by layer from computer models -- provide enormous flexibility, creating many unique components that would previously have required a host of individual machines to produce. Even better, they can bring the manufacturing processes closer to the consumer, cutting down on both delays and shipment costs. In fact, UPS, SAP, and Fast Radius recently joined forces to provide an on-demand 3D printing service, whereby industrial customers can order customized parts to be printed and shipped from any number of Fast Radius locations. While 3D printing could shorten the supply chain by facilitating manufacturing processes independent of a fixed plant location, some companies want to break new ground altogether. One Chinese businessman, Wang Jing, has ambitious plans to build a canal in Nicaragua, thereby gaining exclusive access to an entirely new supply chain channel. According to Fortune, the proposed 172-mile, $50 billion canal would be one of the largest infrastructural projects in human history, at nearly quadruple the size of its Panamanian neighbor. Although plans have stalled and Mr. Wang’s fortune may in fact be drying up, this particular case is representative of a growing trend of supply-side operators pushing to expand their role in the global supply chain. As the supply chain expands across the face of the earth, a select few transporters have recently begun to build up -- into space, that is. With roughly three thousand satellites and a handful of astronauts orbiting our blue planet (see them all floating around here), there’s an increasing -- albeit, still niche -- need for delivery into space. To that end, Elon Musk’s SpaceX program recently made space supply chain history. After the Falcon 9 was launched towards the International Space Station (ISS), the rocket’s booster used its thrusters to slow itself, turn vertically, and land with an absurd degree of elegance on a tiny robotic barge (watch the video here). 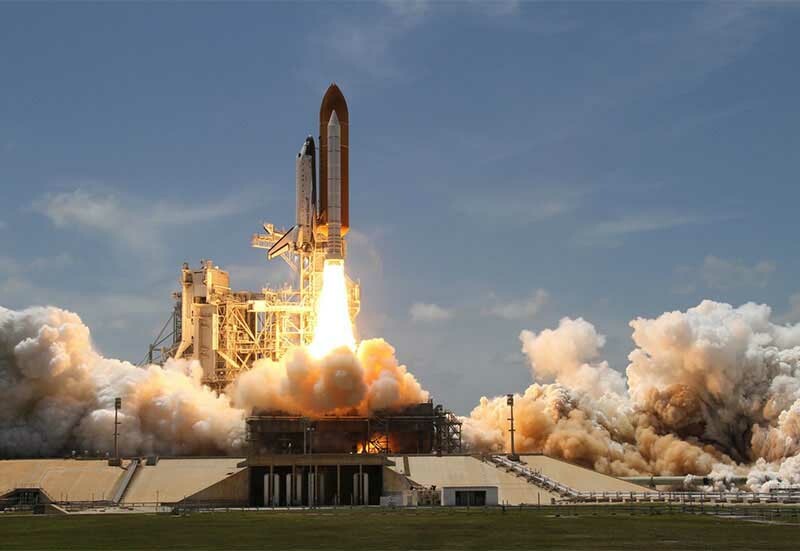 The traditional method of launching heavy objects out of our atmosphere, which relies upon a highly controlled explosion, is incredibly expensive, so technology developed to reuse boosters will dramatically lower the cost of shipping to space. Some experts have suggested that rocketeers simply send a 3D printer to space in order to avoid constantly resupplying -- and many have. While its use aboard the ISS is relatively limited, as it requires abundant material with which to print, 3D printing creates the possibility of moon, planet, or asteroid-based manufacturing centers -- and thus, of ever-more complex supply chains emerging in the cosmos. The supply chain has undergone significant advancements since the days of the Silk Road, and with constant innovation and disruption altering its current path, it will continue to evolve in yet-to-be-seen ways. And as supply chain technologies envelop the entire globe, industry professionals are striving to make their management and operations as seamless as possible, guaranteeing that global trade proceeds faster than ever and without interruption. Get the latest Supply Chain articles delivered to your inbox.